Hello! Did you all see the amazing newly-released stamps for June at 'Inspired by Stamping'? No? Check them out HERE at the store -- you'll LOVE them! A blue rose? Yes, why not! I took my cue from the patterned paper. The light green paper is Prima. It's so subtle you can barely see the design. 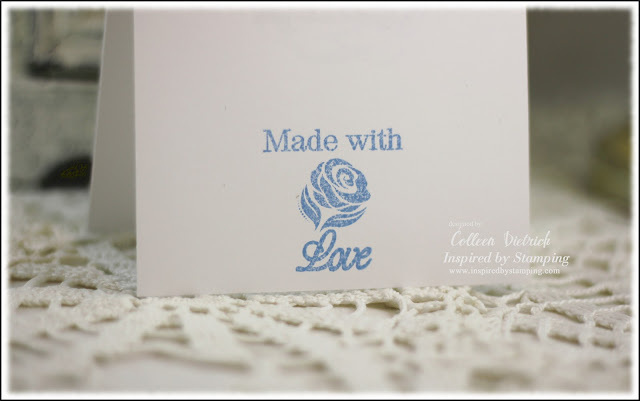 I paired two different rose stamps here: one with a stem, and a full-blown rose with no stem. I love how I can combine these to make what I want! Behind the 3D rose, I've made a 'toile' of sorts, using Mellow Moss ink and another flower from the set. 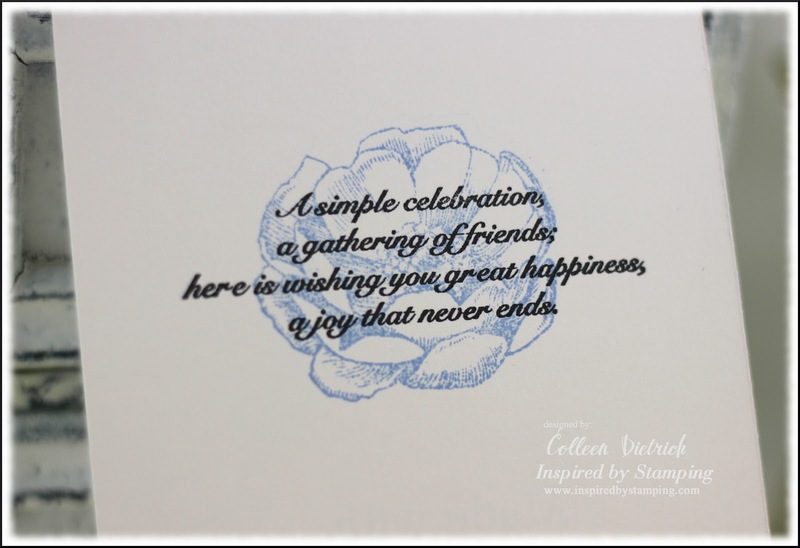 The inside features a flower and a sentiment from Birthday Greetings, another June release. See this sweet little stamp? It's free with orders over $75. Free is always good! Don't forget that this is the last day you can get free shipping on any purchase in the store, too. The code is freeshipping. It's also the last day to put your name in for BLOG CANDY - head over to Joanna's blog for the details. Thanks so much for coming by....I love when you visit! Other: pearls - Recollections, Queen & Co.
Hola Colleen, sorry for not email you, but i like write you a personal e-mail for explain you about my last terrific last year, i have think in your daughter, i hope all is alright now(my english is horrific:D). Oooh Colleen, i think your cards are the most elegant cards i can see, REALLY!fantastic colouring, elegant design. wow...this is incredible! super duper pretty! LOVE your blue rose! I have no doubt that someday we'll see the real thing! Since I'm such a fan of anything blue, must go scope out that paper, too! Another GOR.GEOUS.NESS card. Oh that paper is so pretty and your coloring is quite AWESOME! If I was buying stamps I would get this set for sure! WOW! Absolutely, positively, jaw dropping gorgeous! LOVE it! Amazing card, Colleen. This pretty stamp set is in my wish list! 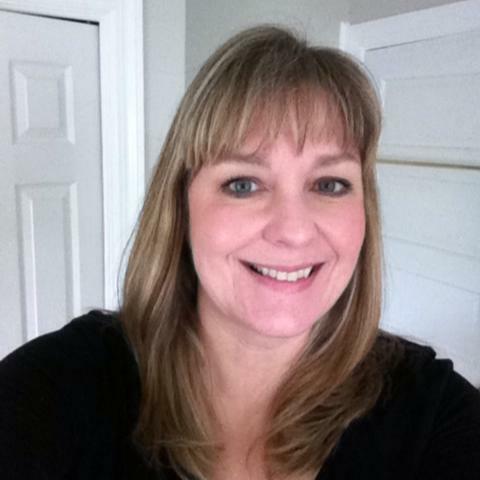 Your flower is gorgeous, Colleen!! Lovely card. This card is beautiful: love your papers and your coloring! This is a very elegant and romantic card. Blessings! Colleen, this card is achingly beautiful!! Your coloring on that beautiful rose is absolutely stunning, and I love how you made your own toile in the background. WOW!! 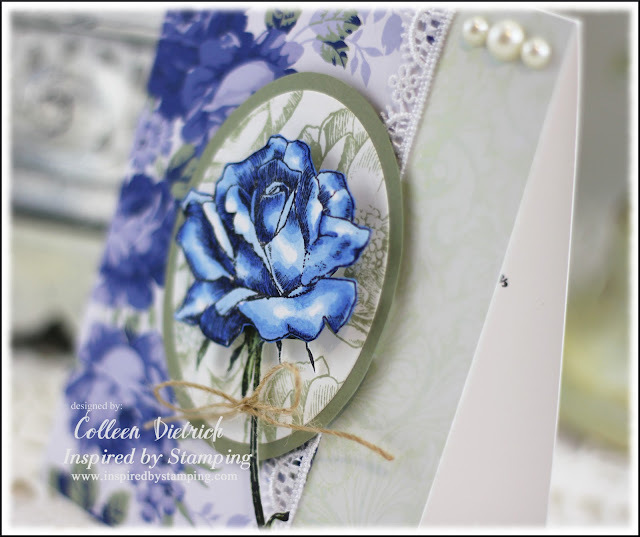 You are ROCKING this Inspired by Stamping release. Fabulous work! OHHHHHHH! Col--this is GORGEOUS! I love that flower and your paper--BEAUTIFULLY done! LOVE x10! Stunning card Colleen!! Love how you colored that flower - it's right up your alley. Looks great with that paper too!! BEAUTIFUL card Colleen!! 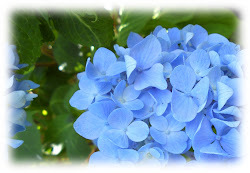 I love the paper and the blur flower-simply gorgeous!! Wonderful card Colleen and I love the roses, coloured to perfection! Thanks for dropping by to say hello. What a Gorgeous card. Your coloring looks amazing. What beautiful roses! Beautifully colored and presented, Colleen! Spectacular! 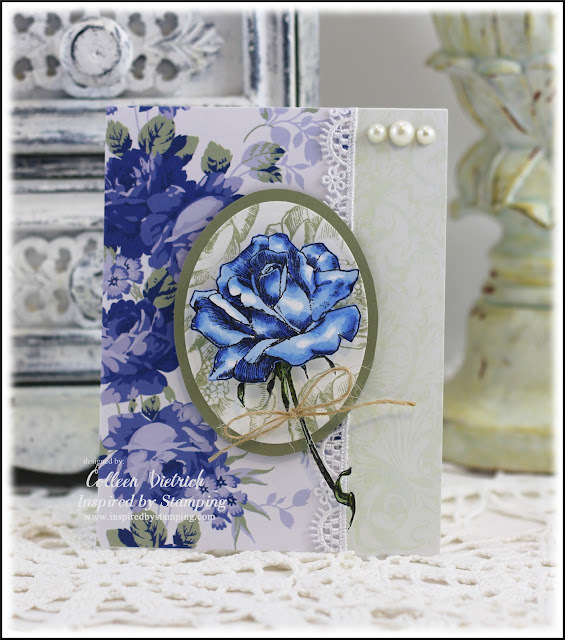 Love the blue rose and your papers are fabulous. This is such a beautiful card!!!! Wow...your coloring rocks! Love your photography skills, too...this card is just a dream!